My name is Lynne and I was born in Staffordshire, in the Heart of England, where I also spent my childhood. In the late 1970s I emigrated from England to the southern most part of the Netherlands… Limburg. After living in the Netherlands for more than 30 years, I have now settled in Germany, together with my cats and my beautiful Friesian mare, Anne-Christel. Today, I live on the outskirts of the peaceful village of Karken, which is near Heinsberg, in the state of North Rhine Westphalia, only 1 mile from the Dutch border, near to the historical town of Roermond. One hour from Eindhoven, Cologne and Düsseldorf; one and a half hours from Brussels and Antwerp. When I look out onto the luscious green fields, where Anne-Christel is grazing, I feel deeply grateful, but also privileged for being able to bring up my cats in such a lovely setting. My girls have the freedom of my home and the privacy of their own apartment, which has access to a safe area outside. They while away their day watching all that is happening around them and playing together in an interesting and stimulating environment. 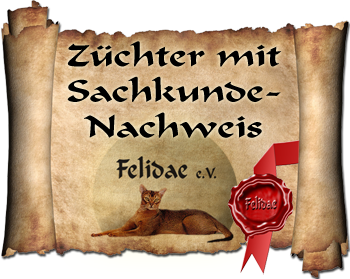 Please feel free to contact me, even if it is just for a cat chat …ich spreche Deutsch …en ook Nederlands et un peu de Français.